Call our Chairman, Michael Borthwick, on 0191 281 1007 or email Michael Borthwick directly on ma13orth@gmail.com. It would be helpful if you could provide your name and telephone contact details (see privacy statement below). 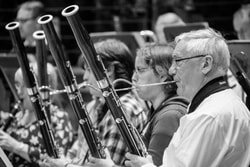 Orchestra North East – Privacy Notice What is this guide for? Read the Data Protection and Retention Policy HERE. ​Whenever we need to collect any of your data, we will let you at that point why we need to do so and what it will be used for, but this guide provides a useful overview of all of those situations and provides more detail on how we keep your data secure and up to date, how long we might hold it for, and what your rights are in relation to it. Orchestra North East (ONE) is committed to protecting your personal data and will use any personal or sensitive data we collect from you in line with the General Data Protection Regulations (GDPR). ONE collects data from individuals to help us plan, organise and run the day-to-day operations of the group (e.g. co-ordinating rehearsals or collecting subscription payments) and to promote and market the group’s activities (e.g. marketing mailing lists and photography/video capture). This data will be used by committee members to manage your membership with ONE and to organise and run our activities. If you give us your consent to do so, we may also use your contact details to send you marketing/promotional communications from the group. Any marketing/promotional communication we send you will include a clear option to withdraw your consent (e.g. to ‘opt out’ of future emails) and you can also withdraw consent at any point by contacting the Data Protection Officer, the Secretary. If our events were to be ticketed, we would need to collect data on the person booking (name and email) in order to allow you access to the event and to send you a confirmation of your reservation/purchase. This data will only be used for administering your access to the event/s for which you have booked and will not be used to send you marketing/promotional messages from the group unless you have also provided your consent to receive these (see below). When you sign-up to our marketing mailing list we will ask for your name and email, and will use this data to send you information about our events and activities (e.g. forthcoming performances, social events and fundraising events). We may also ask for your preferred topics and communication methods. These allow us to tailor the information we provide to suit your preferences. We will only send you information that is related to the group (e.g. we will not use your data to send you marketing messages from 3rd parties). Anything we send you will include a clear option to withdraw your consent (e.g. to ‘opt out’ of future emails) and you can also do so at any time by contacting the Data Protection Officer, the Secretary. If (and only if) you give consent, we may pass your details to related third parties so they can contact you about their activities. We sometimes use third party services to process your data (e.g. Google Dive). We will always make sure any third parties we use are reputable, secure, and process your data in accordance with your rights under GDPR. You can contact the Secretary at any time to update or correct the data we hold on you. ONE’s data retention policy is to review all data held on individuals at least every two years and remove data where we no longer have a legitimate reason to keep it. All requests related to your rights should be made to the Data Protection Officer at lindygilliland@btinternet.com. We will respond within one month. You can find out more about your rights on the Information Commission’s Office website. What will we do if anything changes?